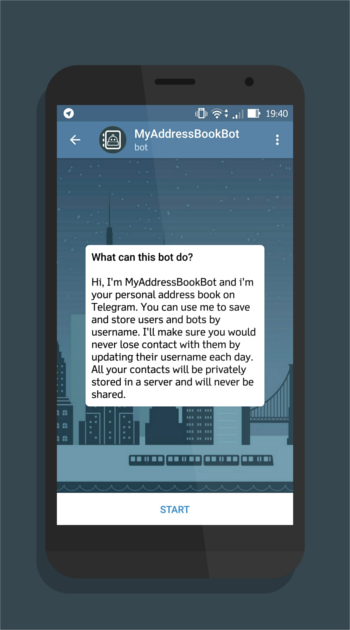 MyAddressBookBot is a Telegram Bot that works as an address book of usernames for Telegram Messanger. Telegram address book saves contacts by telephone number, but most users use the username to get in touch with people on this IM. This bot save contacts by username and let the user modify the basic info. Plus it updates the username of contacts everyday so you’ll never lose them. 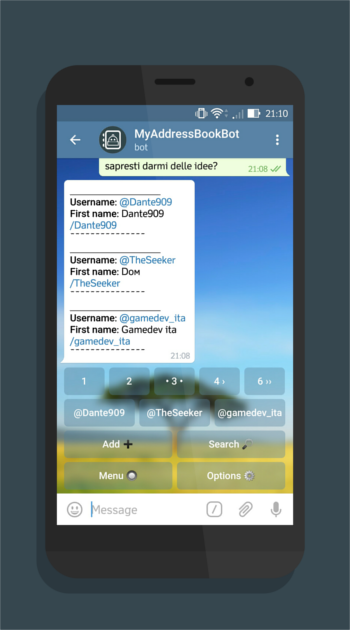 This bot uses the official Telegram Bot API(v2.1), it is based on HadesWrapper for Telegram and runs on a Raspberry Pi3 using php, Redis and Postgresql. MyAddressBookBot is released under the GNU Affero General Public License.